Egyptian leaders are keeping nose to grindstone to mitigate internal disquiet. They are less focused on recovering Cairo’s Arab and regional clout and role. So before Egypt overcomes its internal travails, its leadership will find it hard to conjure up a clear Arab and regional vision. Where events in Syria are concerned, Cairo remains as supportive of the Syrian people as it can be. President Mohamed Morsi’s Syria statements and Cairo’s backing of the Arab League decision giving Syria’s seat to the Syrian Opposition Coalition corroborate this. The Arab League switch would not have been possible without Egypt’s full backing. When discussing Egypt’s stance on Syria, we’re talking by implication about the position of Iran, which sees in Bashar al-Assad’s political survival the cornerstone of its strategy in the region. After all, Iran effectively sacrificed its relations with the best part of the Ummah to preserve this immoral position. And the Islamic Republic’s loss on that matter is immeasurable by strategic standards. Morsi would not have been supportive of the Syrian opposition had he been anxious to win Iran’s heart and mind. He is aware that vexing Iran could tempt her to support and fund his opponents, if not tamper with Egypt’s internal security – chiefly in the soft areas of Sinai, where tribal groups and some Islamists are being led to believe they could challenge “Zionists” from that particular frontline. On his February trip to Egypt for the Organization of Islamic Cooperation (OIC) summit, Iranian President Mahmoud Ahmadinejad did not meet with Morsi except at Cairo airport, which is where Ahmadinejad offered him oil grants and financial support. Morsi simply ignored the offer. Likewise, you can’t read much into the bilateral tourism promotion agreement between Egypt and Iran and the normalization of their commercial ties. By comparison, tourism and commerce links between Turkey and Iran continue to prosper even though the two countries are exchanging blows in Syria and fighting a cold war across the region. This is not to mention Tehran’s attempts to play the Kurdish card – a no-hoper since Recep Tayyip Erdogan made his historic peace deal with the Kurdistan Workers Party (PKK). While Egypt has yet to resume diplomatic relations with Iran and bilateral tourism and commerce is just beginning, Arab Gulf states and the Islamic Republic share a wide range of diplomatic, tourism and trade links. For instance, hundreds of thousands of Iranians travel to Saudi Arabia annually to perform the Hajj and Umrah. Tens of thousands of Iranians also visit the UAE, Kuwait and Oman. So can Morsi and his government overlook Egypt’s economic interests and shut out Iran? And is Egypt’s national security so porous as to be easily compromised by Tehran? This takes us to the preoccupation of many people with Shi’ization (or the “missionary-style” spread of Shiism). In truth, the obsession with Shi’ization is an insult to the Sunni branch of Islam, depicting it as vulnerable and easily pliable, which is far from being the case. Inasmuch as Alawites are part of Shiite Islam, did 40-plus years of Alawite rule in Syria convert the country’s Sunni majority to Shiism? More importantly, was Shiite Iran able to Shi’ize its own Sunni population (of about 10 percent) over the years? Iran’s occasional dabbling in Shi’ization drives is provocative, featherbrained and futile. But the Arabs’ problem with Iran is far from being sectarian. The problem is political par excellence. Egypt, it must be said, is a regional heavyweight with an impressive cultural and historical legacy. It is also home to the millennium-old Al-Azhar University, the foremost institution in the Islamic world for the study of Sunni theology and Islamic law, and to Al-Azhar Mosque. The future will show that whoever thinks Iran can gobble up and Shi’ize Egypt is hallucinating. 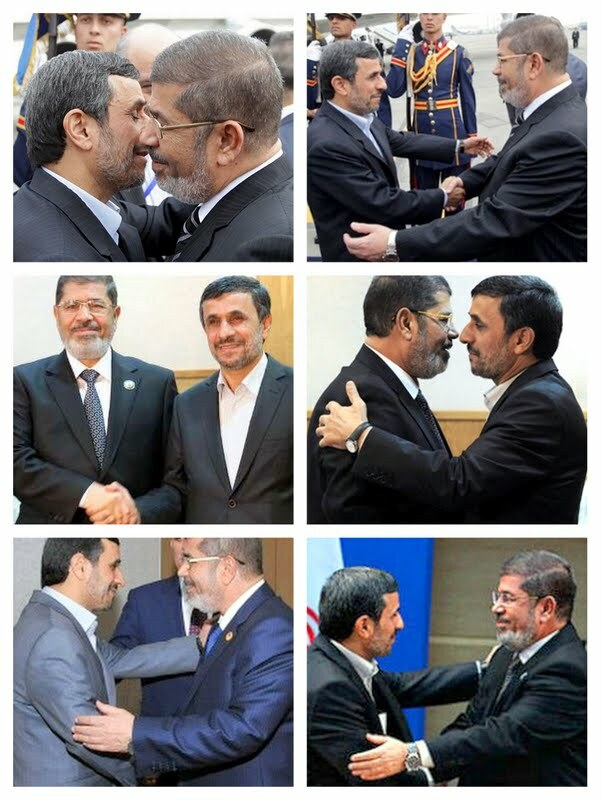 Egypt will never fall in Iran’s lap, neither under Morsi and the Muslim Brotherhood nor under anyone else. Politics, history and the balance of power won’t let this happen. Let’s stop portraying Iran as an omnipotent sovereign when it is wobbling under the weight of its problems in Syria, in Iraq and at home. Iran will revert to its original size once Assad is shown the door. The Arab world will then have no problem building good neighborly relations with Tehran as it now has with Ankara.